Ellen was born and raised in Cincinnati Ohio. Her first taste of photography was when she was 6 years old shooting with her Brownie. She was selected editor of her high school yearbook and was a staff photographer for her college year book. She currently resides in Castle Rock, Colorado with her two black Labradors. After careers in recreation and owning her own retail store, Ellen began pursuing her passion for photography. She studied photography at various photography schools in the Denver area, where she developed her artistic voice. Ellen has completed three bodies of works. 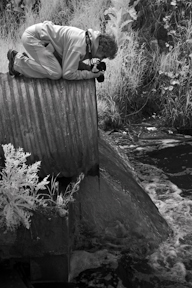 Magnet, is an intimate look at water, seen through Ellen’s lifelong love for nature. Complex Simplicity is a work of abstract photography, showing how the simple really can be quite complex, and Fountainhead, is a cosmic and chaotic view of the symbolism of birth and renewal. Ellen now teaches photography at Digital Photo Academy and has exhibited her work at numerous galleries in the Colorado area, including, RULE Gallery, The Foothills Art Center, Gallery 910 Arts, The Center for Fine Art Photography and Flash Gallery, among others.